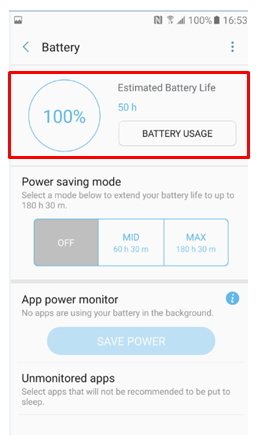 Galaxy J 2017: How does Device maintenance calculate battery remaining time? Q: How does the Device maintenance feature calculate battery remaining time? Device maintenance feature analyzes the battery consumption pattern periodically. The usage time remaining is estimated by learning your usage pattern for a few days. Usage time left may vary depending on your device settings and operating conditions. * Please note: this section is designed to give you basic product troubleshooting information, also refer to your user manual for more information.